This is an edited version of the lecture presented by Professor Nader El-Bizri at the Muslim Heritage Awareness Group (MHAG) meeting organized by FSTC at the Royal Society in London on the 30th of March 2011. The name of our scholar is al-Hasan ibn al-Haytham, known in Latin as Alhazen. He was born in ‘Abbasid / Buyid Basra in 965 CE, and died in Fatimid Cairo sometime after 1041 CE. Imaginary portrait of Ibn al-Haytham, drawn by FSTC. (Source). Although his prolific contributions covered a variety of disciplines in mathematics, astronomy, and mechanics, his direct impact was perhaps the greatest in the field of optics. The epistemic significance of his research also found some of its highest culminations in the development of the rudiments of the experimental scientific method and the associated mathematization of the notions of classical physics. His opus Kitab al-Manazir, the Optics, was composed in seven books, sometime between 1028 and 1038, with his optical research predating that period and stretching back to the beginnings of the eleventh century; and maybe set about 1,000 years ago around the period when he might have migrated from Iraq to Egypt, upon being appointed as court engineer by the Fatimid Caliph al-Hakim bi-Amr'illah to design and construct a damn that controls and modulates the ebb and flow of the Nile. Heading a surveying team, Ibn al-Haytham studied optimal sites in Upper Egypt and came to the conclusion that the construction of a dam on the Nile was unfeasible. Returning to Cairo with this news, he was eventually decommissioned from his offices. Fearing for his life, he feigned madness and was consequently incarcerated in his apartments near the al-Azhar mosque and academy, until the Caliph's death in 1021 CE. Ibn al-Haytham then resurfaced into the public domain and earned his living from copying manuscripts of Ptolemy's and Euclid's treatises. It is believed that he conducted his most innovative research from this period until his death. It is hardly an exaggeration to state that the most remarkable revolution in the classical science of optics from the times of Ptolemy to those of Kepler is embodied by the research of Ibn al-Haytham. One of the principal aspects of his ingenuity is manifested in the resolution he offers of the longstanding ancient dispute between the mathematicians (ashab al-ta'alim; Euclidean and Ptolemaic) and the physicists qua natural philosophers (ashab al-'ilm al-tabi'i; Aristotelian) over the explication of the nature and principles of vision and light. Ibn al-Haytham showed that vision occurs by way of the introduction of physical light rays into the eye in a configuration that is geometrically determined in the form of a pyramid-cone (makhrut) of vision, with its vertex at the centre of the eye, and its base on the visible lit surfaces of the object of vision; while taking into account the rectilinear propagation of light in the homogeneous transparent medium between the observer and the seen object. He thus rejected the theory of the ancient mathematicians, which holds that vision occurs by way of the emission of a subtle and non-consuming ray of light from the eye that meets the lit medium, which, as a physical phenomenon, is structured in the form of an actual pyramid-cone of light. 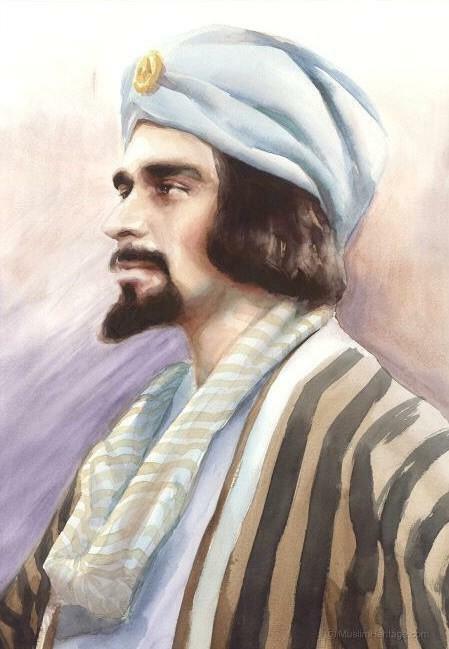 Illustration depicting Ibn al-Haytham by Hanane Kai. (Source). In view of explicating the process of vision, Ibn al-Haytham retains the structural form of a pyramid-cone of direct vision, in terms of geometric modelling, while emphasizing that it is abstracted from matter, and that the lines determining its outline and configuration were purely mathematical (postulated) rather than being physical. He also refuted the physicists' theory of vision (as inspired by Aristotle's Physics and De anima), which conjectured that sight results from the introduction into the eye of the form of the visible object without its matter when the transparent medium (al-shafif; diaphanes) is actualised by physical illumination. Ibn al-Haytham distinguished vision from light, and devised novel methodological procedures that brought the certitude and invariance of geometrical demonstration to bear with isomorphism (instead of mere synthesis) on his research in physical optics. He moreover subjected the resultant mathematical-physical models and hypotheses to experimentation, which did not consist of simple elements of empirical methodology; rather, it was theoretically integral to his proofs, and granted an apodictic value to his inquiries in optics and related disciplines. Ibn al-Haytham's research in optics offered also an optimal epistemic framework for shaping his scientific method, which consisted of combining geometry with physics in the context of experimental demonstration, verification, and controlled testing (i'tibar muharrar); including the design and use of scientific instruments and installations (like his camera obscura; al-bayt al-muzlim). Image from Opticœ thesavrvs Alhazeni Arabis libri septem..., (Basilea, 1572), in Risner's edition of Kitab al-Manazir in Latin. Biblioteca dell'Istituto e Museo di Storia della Scienza, Florene, MED 2068. (Source). Ibn al-Haytham investigated the veridical conditions of visual perception in order to ultimately ground the observational data of his experimental research, along with setting rigorous parameters for the applications of optics in astronomy. His mathematization of the notions of physics is best illustrated in his geometrical definition of place as postulated spatial extension that is secured through a ‘bijection' mathematical function. The significance of his geometrical research on place is confirmed in the 17th century through Descartes' conception of extensio and Leibniz's analysis situs, and by way of the application of studies in linear perspective and conics on architectonic and spatial contexts that became apparent via Gérard Desargues' projective geometry. Ibn al-Haytham refuted Aristotle's definition of topos in Book Delta of the latter's Physics, in terms of offering a mathematical solution to a problem in theoretical philosophy. This was also undertaken against the broader background of solving selected mathematical problems that resulted from the unprecedented developments in the use of geometrical transformations (similitude, translation, homothety, affinity, etc. ), stereographic projections, the introduction of motion in geometry, the anaclastic research in conics and dioptrics, all within the Apollonian-Archimedean Arabic legacy. Ibn al-Haytham's research in geometry and optics (including his studies in catoptrics and dioptrics, respectively on the principles and instruments of the reflection and refraction of light) built on and expanded the epistemic bearings of the investigations of his predecessors — of ninth-century polymaths, like the Banu Musa (the sons of Musa ibn Shakir), Thabit ibn Qurra and his grandson Ibrahim ibn Sinan, and of tenth-century mathematicians, like al-Quhi, al-Sijzi and Ibn Sahl. Ibn al-Haytham's Kitab al-Manazir was translated from Arabic into Latin towards the end of the twelfth century, under the title Perspectiva or De Aspectibus. The Latin versions of Ibn al-Haytham's Optics had a major impact on the research of Franciscan opticians in the thirteenth century, like Roger Bacon, John Peckham, and particularly Witelo. Ibn al-Haytham's tradition influenced also the investigations of fourteenth century opticians, like Theodoric (Dietrich) of Freiberg in Europe, and Kamal al-Din al-Farisi in Persia; both scholars offered correct experimentally-oriented explications of the phenomenon of the rainbow, while grounding their studies on reformed revisions of Ibn al-Haytham's theory in meteorological optics (relying on two distinct channels of transmission, in Latin within Europe, and in Arabic within Islamic civilisation). Ibn al-Haytham's legacy in history of science in Islam continued to be subsequently influential through the investigations of the Syrian astronomer at the Ottoman court, Taqi al-Din Muhammad Ibn Ma'ruf (d. ca. 1585 CE). Diagram of the eye from Risner's edition in of Kitab al-Manazir in Latin: Opticœ thesavrvs Alhazeni Arabis libri septem (E. & heirs of H.Episcopius, Basel, 1572, p. 6). Credit: Wellcome Library, London. (Source). The Latin translations of Ibn al-Haytham's Kitab al-Manazir, in addition to works associated with geometry and conics, in relation to Arabic sources in mathematics, impacted also Renaissance scholars of the calibre of Biagio Pelacani da Parma, Francesco Maurolico, Ettore Ausonio, Egnazio Danti, and Francesco Barozzi. Ibn al-Haytham's Optics was also assimilated in Renaissance scholarly circles, partly through the mediation of thirteenth century Franciscan opticians, and it influenced the perspective pictorial-art theories of Leon Battista Alberti in the De picture, and more significantly Lorenzo Ghiberti's Commentario terzo (the latter relied on a fourteenth century Italian rendition of a Latin version of Ibn al-Haytham's Optics, entitled Prospettiva). This ultimately informed the debates over the costruzione legittima (legitimate construction) in the procedures of establishing linear perspective. A printed edition of Ibn al-Haytham's Latin version of the Optics was established by Friedrich Risner in 1572 in Basle, under the title Opticae Thesaurus, which was eventually consulted by seventeenth-century scientists of the calibre of Kepler, Descartes, Huygens, and possibly Newton, or at least was available to Newton. The recognition of Ibn al-Haytham's oeuvre is also evident in the high station he was accorded by the seventeenth-century scientist Johannis Hevelius, whereby the frontispiece of the latter's Selenographia sive Lunae Descriptio (dated 1647) depicts Ibn al-Haytham standing on the pedestal of ratione (reason), with a compass in his hand and a folio of geometry, while Galileo stands on the pedestal of sensu (observation), holding a telescope. An investigation of the historical and epistemic entailments of Ibn al-Haytham's tradition in optics elucidates some of the dynamics that were at work in the emergence and development of its novel scientific rationalities. His legacy established the principal scientific foundations of mediaeval perspectiva traditions in the European milieu, and, through them, it grounded in part selected Renaissance theories of vision and perspective, while continuing furthermore to influence the unfolding of the science of optics up till the seventeenth century. Nader El-Bizri, "Classical Optics and the Perspectiva Traditions Leading to the Renaissance", in Renaissance Theories of Vision, eds. Charles Carman and John Hendrix. Aldershot: Ashgate, 2010, pp. 11-30. Nader El-Bizri, "Corollaries on Space and Time in Arabic Sciences and Philosophy", in Chrono-Topologies: Hybrid Spatialities and Multiple Temporalities, ed. Leslie Kavanaugh. Amestredam: Rodopi Press, 2010, pp. 63-78. Nader El-Bizri, "Ibn al-Haytham et le problème de la couleur", Oriens-Occidens: Cahiers du centre d'histoire des sciences et des philosophies arabes et médiévales, CNRS 7 (2009), pp. 201-226. Nader El-Bizri, "Le problème de l'espace: Approches optique, géométrique et phénoménologique," in Oggetto e spazio. Fenomenologia dell'oggetto, forma e cosa dai secoli XIII-XIV ai post-cartesiani, eds. Graziella Federici Vescovini and Orsola Rignani. Firenze: SISMEL, Edizioni del Galluzzo, 2008, pp. 59-70. Nader El-Bizri, "In Defence of the Sovereignty of Philosophy: al-Baghdadi's Critique of Ibn al-Haytham's Geometrisation of Place", Arabic Sciences and Philosophy 17 (2007), pp. 57-80. Nader El-Bizri, "Al-Farisi, Kamal al-Din," in The Biographical Encyclopaedia of Islamic Philosophy, ed. Oliver Leaman. London/New York: Thoemmes Continuum, 2006, Vol. I, pp. 131-135. Nader El-Bizri, "Ibn al-Haytham", in Medieval Science, Technology, and Medicine: An Encyclopedia, eds. Thomas F. Glick, Steven J. Livesey, and Faith Wallis. New York/London: Routledge, 2005, pp. 237-240. Nader El-Bizri, "Optics", in Medieval Islamic Civilization: An Encyclopedia, ed. Josef W. Meri. New York/London: Routledge, 2005, Vol. II, pp. 578-580. Nader El-Bizri, "A Philosophical Perspective on Alhazen‘s Optics", Arabic Sciences and Philosophy 15 (2005), pp. 189-218. Nader El-Bizri, "Ibn al-Haytham, or Alhazen", in Medieval Islamic Civilization: an Encyclopedia, ed. Josef W. Meri (New York – London: Routledge, 2005), Vol. I, pp. 343-345. Nader El-Bizri, "Maqal Ibn al-Haytham fi al-makan wa makanatuh fi tarikh al-riyadiyyat wa-al-'ulum", in al-Hayat, Turath (Classics Supplement), Issue 15612 (31 December 2005), p. 19. Nader El-Bizri, "La perception de la profondeur: Alhazen, Berkeley, et Merleau-Ponty", Oriens-Occidens: Cahiers du centre d'histoire des sciences et des philosophies arabes et médiévales, CNRS 5 (2004), pp. 171-184. Ibn al-Haytham. Kitab al-manazir, ed. A.I. Sabra. Kuwait: National Council for Culture, Arts and Letters, 1983, 2002. Ibn al-Haytham. The Optics of Ibn al-Haytham, Books I–III, On Direct Vision, trans. A. I. Sabra, London: Warburg Institute, 1989. Ibn al-Haytham. Majmu' al-rasa'il. Hayderabad: Osmania Publications, 1938. Hogendijk, Jan P. Ibn al-Haytham's Completion of the Conics. Dordrecht: Springer, 1985. Lindberg, David C. ‘Alhazen's Theory of Vision and its Reception in the West'. Isis 58 (1967): 321–341. Mark Smith, Albert. Alhacen's Theory of Visual Perception. Philadelphia: American Philosophical Society, 2001. Nazif, Mustafa. al-Hasan bin al-Haytham, buhuthuh wa kushufuh al-basariyya. Beirut: Markaz dirasat al-wihda al-'arabiyya, 2008. Omar, Saleh Beshara. Ibn al-Haytham's Optics: A Study of the Origins of Experimental Science. Minneapolis: Bibliotheca Islamica, 1977. Rashed, Roshdi, Les mathématiques infinitésimales du IXe au XIe siècle, Volume IV: Ibn al-Haytham, méthodes géométriques, transformations ponctuelles et philosophie des mathématiques. London: al-Furqan Islamic Heritage Foundation, 2002. Rashed, R. Geometry and Dioptrics in Classical Islam. London: al-Furqan Islamic Herirage Foundation, 2005. Raynaud, Dominique. ‘Ibn al-Haytham sur la vision binoculaire: Un précurseur de l'optique physiologique', Arabic Sciences and Philosophy 13 (2003): 79–99. Russell, Gül A. ‘The Emergence of Physiological Optics', in Encyclopedia of the History of Arabic Sciences, Volume II, eds. Roshdi Rashed and Régis Morelon. London: Routledge, 1996. Sabra, Abdelhamid I. ‘Sensation and Inference in Alhazen's Theory of Visual Perception', in Studies in Perception: Interrelations in the History of Philosophy and Science, eds. Peter K. Machamer and Robert G. Turnbull. Columbus: Ohio State University Press, 1978. Sabra, A. I. ‘Ibn al-Haytham's Lemmas in Solving "Alhazen's problem"‘, Archive for History of Exact Sciences 26 (1982): 299–324. Schramm, Matthias. Ibn al-Haythams Weg zur Physik. Wiesbaden: Franz Steiner Verlag, 1963. Vescovini, Graziella F. ‘La fortune de l'Optique d'Ibn al-Haitham: Le livre De aspectibus (Kitab al-manazir) dans le moyen âge latin', Archives internationales d'histoire des sciences 40 (1990): 220–238. Vescovini, G. F. ‘Ibn al-Haytham vulgarisé. Le De li aspecti d'un manuscrit du Vatican (moitié du XIVe siècle) et le troisième commentaire sur l'optique de Lorenzo Ghiberti', Arabic Sciences and Philosophy 8 (1998): 67–96. *University of Lincoln, Brayford Pool Lincoln, UK / University of Cambridge, Cambridge, UK / Centre National de la Recherche Scientifique (CNRS), Paris, France / Institute of Ismaili Studies, London, UK.